Ss have to choose the correct answer from three given options, I used pictures because I think ss, like colorful exercises. 22 sentences prepositions of time with business related vocabulary. 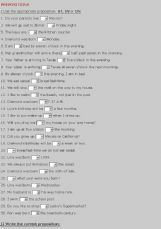 An exercise that deals with some common collocations and expressions. An exercise to practice the use of prepositions of location as well as the use of verb to be in an elementary level. 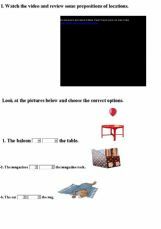 These are some good exercises to practice with prepositions of place at the same time students learn some household items. Hope, you�ll enjoy it! This is an exercise on prepositions and prepositional phrases which I give students for extra classes but it can be used for every day practice as well since there are many useful examples. The sentences given represent everyday situations. Hi! 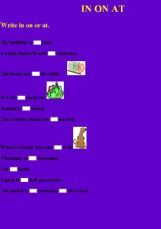 This is my first on-line exercise I�ve made for my students to make a revision of prepositions. It�s focus on prepositions of time: In, On or At. I hope your students will enjoy it! Testing a new game: snakes and ladders.